See the city's historical sites in a whole new light with the cool, evening breeze in your hair. Beautiful by day, Bangkok's many temples and pagodas glitter in the light of the setting sun. 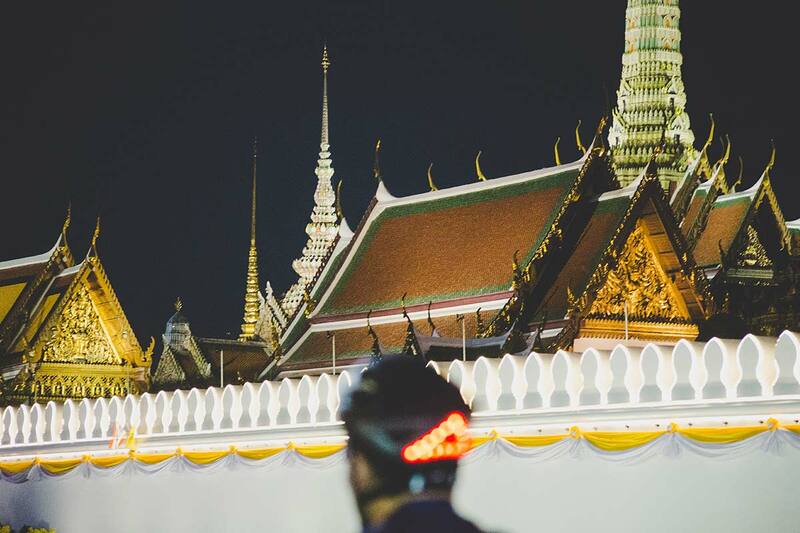 Cycle through the heart of old Bangkok and admire the view of the city from the stupa atop the Golden Mount. Visit the symbolic Temple of the Giant Swing to get a feel for the nation's faith depicted in the evocative frescoes retelling the Buddha's teachings. Ride to the colorful Pak Khlong flower market and savor the scents of variety of roses, orchids, and jasmine, twisted into beautiful arrangements for Buddhist religious offerings. The highlight of this trip is the stunning view of Wat Arun, the Temple of Dawn, from across the river. Watch the sun go down behind the silhouette of this striking riverside landmark adorned with thousands of colorful Chinese porcelain tiles. Riding onward past the regal Grand Palace to see the remaining sunlight glisten on the golden rooftops is nothing short of breathtaking. Our tour departs at 16:15 am from the Srikrungthep Hotel, in the heart of old town Bangkok. Click here for a map. Optional hotel pick up available on request for a fee. I wanted to thank you for the sunset tour of Bangkok we did last night with Bird. We travel a lot, have done many tours - this was the best tour we have been on. We expected to see all the sites, but traveling along all the backstreets, laneways and passages, we saw a city that we didn't know existed - so many sights, sounds, smells it was overwhelming. We got to see how real people lived, with magical glimpses into the lives of Bangkok people at every turn. Bird was friendly, informative, interesting and very generous with his time. We cycled for many kilometres without ever getting tired, we were so energized and excited by Bird's tour. What a great asset he is for your company! Bangkok is stunning at night. I loved being able to tour Bangkok with a local. My favorite part was biking on the back roads and alleyways, through markets and alongside the canals. Next stop will be Wat Suthat, or Temple of the Giant Swing, one of the oldest and largest temples in Bangkok and is famed for its huge golden Buddha, magnificent frescoes. We continue cycling through hidden alleyways and end up at replica of an old drawbridge. Once across the canal we ride on the road to the famous Pak Khlong flower market. Though busiest pre-dawn, it is open 24 hours and you'll see a variety of flowers from roses to orchids in a rainbow of colours, as well as some creative arrangements. Back on the bikes we ride to an almost forgotten oasis of Nakraphirom Park in time to watch the sunset over Wat Arun, the Temple of Dawn. This striking tower of riverside landmark is covered with thousands of pieces of multi-coloured Chinese porcelain. Once we have had our fill we ride past the Grand Palace and see the sunlight hit the golden roofs. We'll soon find ourselves on a small riverside path, with a perfect view of the Pinklao Bridge. We'll take a break at the park that surrounds the octagonal Phra Sumeru Fortress, truly twist and turn through some back roads to wind up at Wat Indra Viharn that boasts a 30-metre high statue of Buddha brilliantly lit up at night. We pass the Marble Temple on our way to Government House, and ride past the shimmering Wat Ratchanada and Loha Prasat, a multi-tiered structure with 37 metal spires on our way back.